Three thousand feet above sea level, alongside the Achensee lake and surrounded by wooded hills and mountains, this impressive site has been redesigned and extended to exceptional standards. 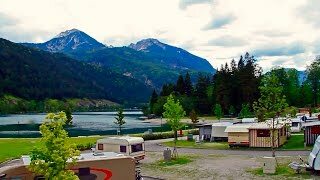 Easily accessible from Munich, Salzburg and Innsbruck, it offers everything needed for an active family holiday and for exploring the lake and its surroundings. There are 210 pitches, 110 for tourers, all with 16A electricity. 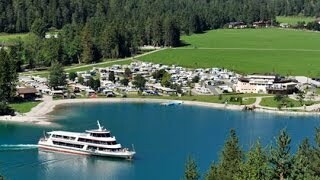 Forty new all-weather comfort pitches are close to the restaurant and bar, which overlook the site and the lake. 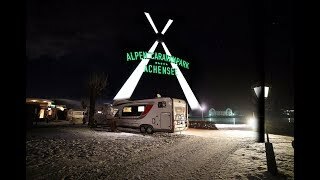 There has been camping here since 1961, but imaginative management is now taking Alpen Caravanpark to a new level. The extensive playground incorporates a private section of Lake Achensee, with beach swimming. The main lake offers all manner of watersports, and a cruise boat calls near the site every hour. It links to a traditional steam cog train to Jenbach in the Inn valley. In winter, a free bus runs to the nearby cable cars and ski slopes, while cross-country skiing direct from the site is popular. Walking and cycling trails abound. 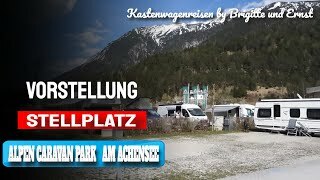 The Achensee Card can be purchased, which gives free bus travel and discounted rates at numerous attractions, including cable cars. New heated sanitary block has free showers, a baby room and facilities for disabled visitors. Bathrooms for hire. Washing machine and dryer. Drying room. Motorhome services. Freezer for ice packs. Shop for basics. Restaurant and bar. Playroom, activity room and youth room with games (charged). Large lakeside playground. Football pitch and beach volleyball court. WiFi (charged). Lake swimming and boat launching. From A12 take exit 39 on to B181 northbound signed Achensee. Pass end of lake and turn left into Achenkirch. Follow road through village to site.